We are going to carry out a series of posts reviewing the different constructive solutions that we have tested, accompanying them in addition with an explanatory video of how to make its correct installation. We start today with a new metallic structure protection test using a Tecbor® board which has given excellent results of minimum coating thickness compared to other products, leaving the installation ready for painting. This difference of values ​​is explained by the fact that the surface exposed to the fire in a Contoured Mass, for this type of normalized profiles, is greater than in Masked Masses. Once we get the value of the mass, which tells us what the behavior of the profile will be to fire (The higher this value, the worse its behavior and the more protective layer thickness will need), it is necessary to determine with the normative in force, normally DB-SI or RSCIEI, the Fire Resistance that will be requested for this structure. The Fire Resistance of this structure is called “R” or “Load Capacity” and it is the same as the old EF or Fire Stability followed by the minutes that will be required to hold until reaching the Critical Temperature, which is usually going to be 500 ° C. This may be R-15, R-30, R-60, R-90, R-120, R-180 or R-240. Once these two values ​​are obtained (Massivity and Fire Resistance) we go to the test table of the product, in our case Panel Tecbor® and determine the thickness of the corresponding product. Once obtained the value of the minimum necessary thickness, we go to the thicknesses of Tecbor Board that we have commercialized and we choose the one that best suits our request. 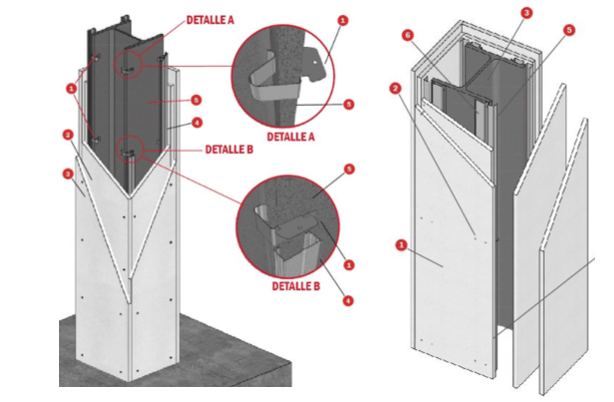 Now it is necessary to see how these panels should be supported to the metal profile, the plate should not be directly anchored to the profile, because the greater dilations of the metal element with respect to the Tecbor would cause the panel to crack. It is also very important to verify how is the support made by the manufacturer of the product, since there are some that test with air chambers up to 30 cm between the plate and the profile and then the installer places it directly without camera, failing an important part of the test. Our anchorage system is called Clip Tecbor®, although it is also possible to carry out the support with omegas or channel type PYL.